One of the most heavily used rooms in the house is the kitchen. If it isn’t functional, it can immediately feel inconvenient and make daily life a bit frustrating. By getting a professional kitchen remodel, homeowners can benefit from efficient and expanded storage, more functional layouts, and updated fixtures and appliances. These updates serve as remedies to the pain points that an outdated kitchen imposes. Determining what to remodel in your kitchen is an is a function of your tastes and your use of the space. Before you make any permanent changes, it’s important to discuss these needs with those you live with and to get the help of a professional remodeler. The experts on our team can help you determine what your home needs. 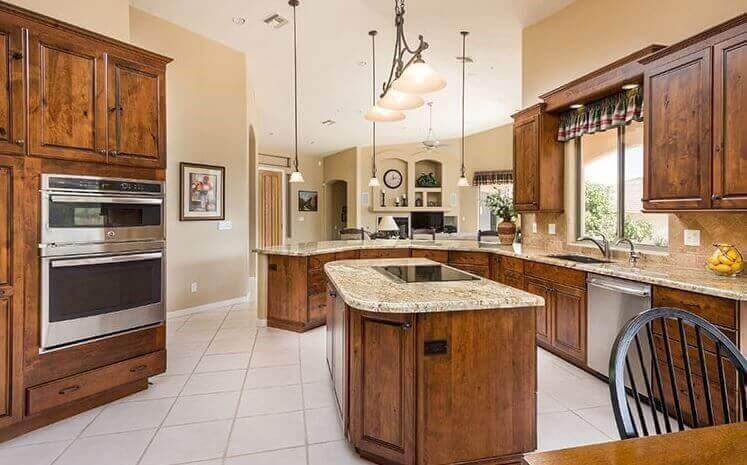 To generate some ideas, here are a couple of the best Scottsdale kitchen remodeling customer stories. Sue and Harry loved their house’s location for the amazing views of the lake, its size, and general layout. However, the house showed its age at 16 years old, so a home remodel was always in their plans. The couple also had big plans for the kitchen, which needed to keep up with the rest of the house’s modern updates. Utilizing the color scheme of white and grey, the designers at Republic West Remodeling created a seamless look that unified the house. The kitchen also reflected this look by adopting light grey floors and white cabinetry with stainless steel handles to match the new appliances. Soft lighting over the counters added to the functionality and luminous ambiance of the reinvented space. Kyle and Pam bought their home with its potential in mind. There were two floor-to-ceiling walls that partitioned the kitchen from the family room and the great room. Though it was common to have closed off rooms in the 80s and 90s, it didn’t work well with the modern, open floor plan they desired. By knocking down the walls, Kyle and Pam created an inviting, open space that would become a kitchen-family room-great room combo. This open area was the cornerstone of their vision for a modern home that allowed more freedom in design and better entertaining possibilities. In addition to these structural changes, the couple decided to upgrade the kitchen’s main components. They ended up replacing the old black appliances and maple cabinetry with stainless steel appliances and darker wood cabinets. Everything worked together well with the beige paint, granite countertops, and the contemporary light fixtures that Republic West Remodeling also incorporated into the design. The updated contemporary floorplan and color scheme had a profound effect on the rest of the house. The large open space that they created set the tone for a modern and functional home. By making these changes to their kitchen, they added value and longevity to their home. This is one example in which you can buy a home for its potential instead of it being an immediate “shoe in” fit. Sometimes you find the right neighborhood and location but the house you want just needs some updates to become the right house for you. With the help of Republic West Remodeling, Kyle and Pam acquired their dream home. At Republic West Remodeling, we understand that though homeowners make mental tallies about “things to fix”, their vision may not be complete. The demands of daily life and responsibilities mean that outsourcing the creativity to professional designers can bring out the most of your kitchen’s potential. When you work with us at Republic West Remodeling, we guarantee the work with our Dream Assurance Plan. 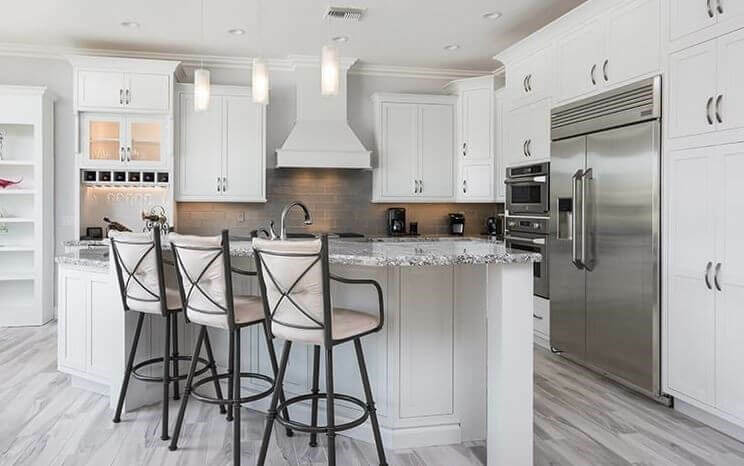 For more information about getting a kitchen remodel Scottsdale residents have been thrilled with, check out our remodeling process. At Republic West Remodeling, we want to make you proud of your kitchen. To start the conversation about your Scottsdale kitchen remodeling project, contact us for a free consultation today.